Last night, during the opening performance of The Odd Couple, we were able to enjoy and appreciate an element of live theatre that makes it completely different than what we watch on screens: surprise, and what happens when things go wrong. It was near the top of Act Two when Roy, played by Michael Beamish, seemed to have a devil of a time getting the front door open to make his exit. It eventually gave way and he was able to leave. Then Murray and Vinnie (played by Tim Heggie and Jim Geary) tried to leave. The door didn't let go at all. They tried a second time, but still no luck. "There's a back door in the kitchen," piped up Felix, played by Zenon Campbell. "Oh," said Murray. "We didn't know." And they left through the kitchen, leaving the crowd in stitches. It was a classic theatre moment, a set malfunction that required the players to come up with a solution in front of live audience and integrate it into the story. As the scene came to an end and Felix began setting up for the big date, a shadow appeared on the offstage side of the stained glass window of the front door. A few loud noises and a figure popped into the scene: the apartment complex repairman, complete with tool box, white sleeveless undershirt, and a short bow. The show continued on in brilliant fashion and the cast was able to bask in the glow of a lovely (and immediate) standing ovation as they took their selfie. 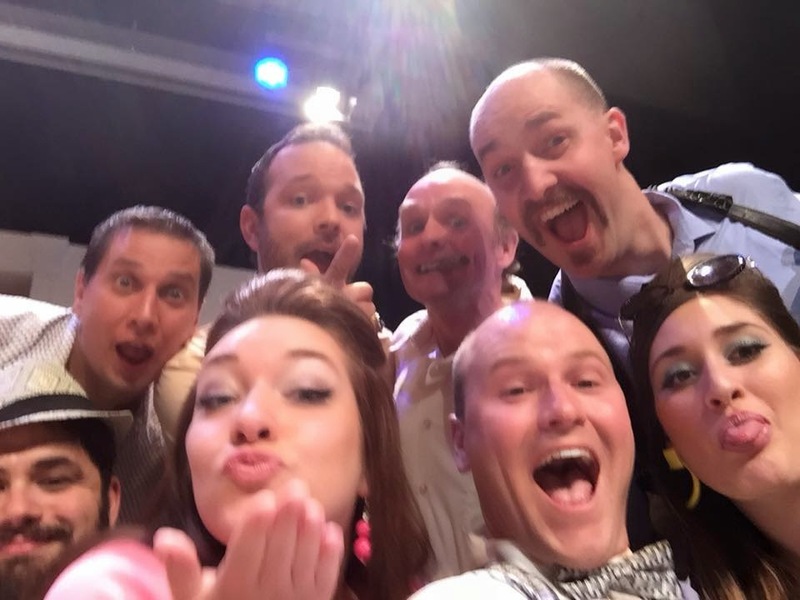 With two more performances to go in this short run, I hope you take the opportunity to see The Odd Couple and all of its surprises, planned and not-so-planned.